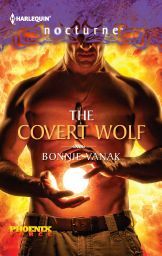 Here's the cover for my July 24 Harlequin Nocturne, THE COVERT WOLF. First in The Phoenix Force, a new series about an elite group of Navy SEALS who are paranormals. This book features Matt, a Draicon werewolf. Fire plays a big role in this book. Matt and the heroine, Sienna, must find an orb of magick before fire demons use it against Matt and his team. You can pre-order The Covert Wolf here on Amazon. And save 34% by ordering here on Barnes and Noble.